If you would like to use all the assets of the EnvokeIT Support Manager the program should be installed on Citrix Presentation Servers. The installation is MSI Based, which is a very basic installation. During the installation you need to accept the license agreement and specify the destination location for the product. Therefore, although I could not find any documentation about it, I aspect the product can be installed unattended without any problems. The only requirement for the product is .Net Framework 2.0. The product is capable of using a centrally located configuration source, so the product can be installed on more servers for redundancy and fault tolerance. Configuration of the product is based on two levels. After the first installation the basic configuration should be configured. This is done by starting the product via the executable (ESM.exe). By design the first time you start the application a message appears mentioning that the license file can not find. To resolve this you need to copy the license file to the Configuration Store location as specified in the product. The configuration starts with specifying the location of the Configuration Store. By default this is a location in the profile of the logged on user, but logically you would like to specify a central location, so the configuration can be shared to more helpdesk employees. 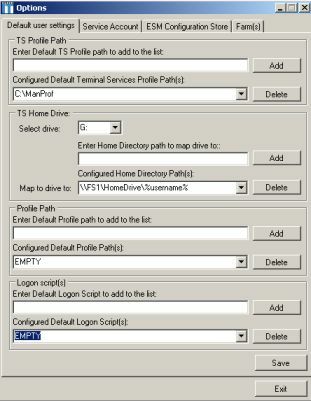 Secondly you need to specify the basic settings of your environment like the location of the (Terminal Server) profiles, home drive, drive letter, login scripts and similar. It is possible to add more locations per configuration item. For example two shares for storing the profiles. If you do not use an option (for example the "normal" profile) you need to enter EMPTY as the location, so during working with the application this component will be checked as correct. You can also specify an account that will be used for collecting information that is not possible via a normal user account (for example auto created printers. Secondly you can specify roles/services which are available in the organization. This can be based on several visions, but probably the most used is based on department. Per role you can specify a kind of profile filled with the Active Directory groups. These roles can be used to check if a user is added to all the right groups to perform his daily job. Envoke-IT support manager also support multiple Citrix Farms. This is a nice feature so using one tool al the sessions on different farms can be viewed and maintained. When using a central located Configuration Store you need to specify access right on the share to arrange which persons can be altering (or not) the configuration. It is pity that it not possible to define roles within the product. For example a role which can not alter the basic configuration, but can make changes to the roles in the organization. It is now possible by altering the rights per configuration file using the operating system rights (there is a separate file for configuring the roles), but it would be nice if these can be arranged out of the product. The IT employee using the ESM (EnvokeIT Support Manager) must have at least view rights within Citrix Presentation server Console to start the application. Also the user must have enough right to perform management on the user (for example reset the password) if you would like enabling your helpdesk employees with the available tasks out of the tool. To enable all the possibilities the product must be started as Citrix session. To start the application directly with the correct Configuration Store you need to the configpath.xml to directory the product is installed. 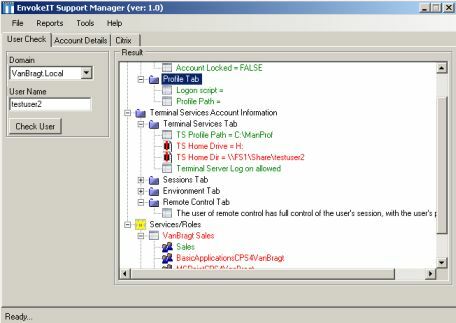 To main entrance point for Support Manager is a user calling with an issue. The helpdesk employee enters the username in the product and pushes the search button. Support Manager will then collect all the information from Active Directory and the configured Citrix Farms, followed by displaying the information in the product. The information is displayed on three tabs. The first tab is displaying the properties available in the AD. These properties are compared with the default configuration settings specified in the Support Manager. If the properties match they are displayed in green, while deviant settings are displayed in red. The helpdesk employee can alter directly out of the tool the password, the profile path, the terminal server path and unlock the account. I personally would like to see this extended with all the settings displayed in this tab. Also the defined roles are displayed. A helpdesk employee can add and/or remove a user to each role. The function will add or remove the user to/from all the groups associated with this role. On the second tab all the properties of the user available in Active Directory together with the groups the user is member of. This tab only allows viewing the properties, no changes can be made here. The last tab is the replacement of the Citrix Management Consoles. This tab shows the published applications and connected servers of the selected user (the view can be changed to view all available sessions). Within this tab the most used options are available like: Send Message, Logoff session, Disconnect session, Shadow and retrieve all auto created printers and view all session properties. If the helpdesk employee can not fix the problem he can save the displayed information into a report so the 2nd line does not have to collect the information again. The reports can be opened again in the Support Manager. EnvokeIT already announced some additional features that will be implemented in version 2.0 like Resultant Set of Policy data and Added properties to configure in the company policy part. The EnvokeIT Support Manager will be very useful for organizations struggling with the 1st line information gathering or support tools jungle. The most used and needed properties are displayed and some of them can already be adjusted out of the tool. Also with a single click the information can be saved in a report that can be adjusted by the next level of IT employees to solve the problem if the helpdesk employee can not accomplish that. The tool has lots of potential if EnvokeIT will extend the possibilities to change settings out of the tool. They have already announced some new features for version 2. I would like to see they also add more settings than can be adjusted out of the tool and add shortcuts to the necessary tools to allow change "advanced settings". Also it would be nice to add some of delegation of control configurable out of the tool. Easy installation and configuration including multiple Citrix Farms support. Not all displayed properties can be adjusted using the tool directly.